Lately I have been busy with life and work, so unfortunately I haven’t had much time to blog. 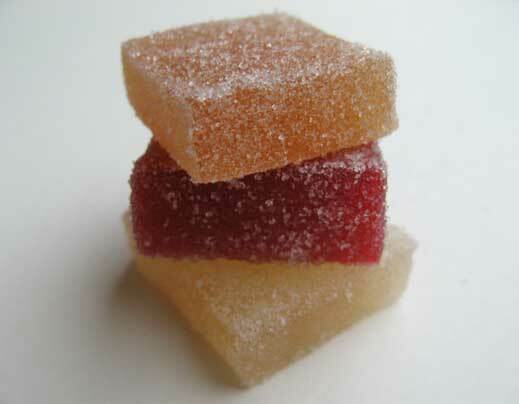 I did however make time to research and make one of my favourite confections, pâtes de fruits (fruit jellies). My post this week is my entry for two different blogging events. First, Canadian Blogging By Post #2 hosted by the lovely and wonderful Jasmine of Confessions of a Cardamom Addict. The theme for this second installment of CBBP is “Our Seasons Bounty”, which is where I got the inspiration for making pâtes de fruits in the first place. I started with apples because they are in season, inexpensive and contain lots of pectin. #24, hosted by Jeanne of Cook Sister!. This month’s theme is Little Bites of Delight (petit fours, mignardises, friandises). Since I was making the pâtes de fruits, I thought that it was a great fit as a mignardises. I remember it being served to me as a mignardises when I had a spectacular dessert tasting at Les Chèvres when I was in Montréal earlier this year. I tried a few different recipes for pâtes de fruits. This recipe is relatively simple and gave good results. The recipe is from Lenotre's Ice Creams and Candies. In this book, there is more specfic information regarding different flavours of pâtes de fruits and cooking times. These homemade fruit jellies are softer than commercial ones but taste just as good. If you are wanting to make the ones exactly like what you find in the stores, use apple pectin. Apple pectin is however quite difficult to find, but if you are able to find it, I suggest using it for a firmer jelly. Preparing the fruit: wash, peel, and seed the fruit as necessary. Most fruits are then pureed. Some fruits are used as they are and others are mixed with syrup from canned fruit. Because of their relatively neutral taste, pear, peach or apricot syrups are the best; they can even be mixed together. Preparing the Mold and Jelling Agent: On a baking sheet or other surface that can stand high temperatures without cracking or warping, place a sheet of nonstick parchment paper and set the metal frame, flan ring, or metal rulers on it; or simply line a small brownie pan with parchment paper. Cooking the Fruit Jelly: In a large saucepan, place the fruit pulp or fruit pulp-syrup mixture and the sugar. Bring to a rapid boil over high heat, stirring constantly with a spatula. Once a full, rolling boil is reached, start the cooking time; this will be from 4 to 9 minutes, always at a rapid boil and stirring constantly, depending on fruit used. Add the butter halfway through the cooking time. When it is time, remove the saucepan from the heat and immediately add the liquid jelling agent; stir vigorously for a few seconds to be sure that is completely mixed into the jelly mixture. To Mold, Cut, and Serve the Fruit Jellies: As soon as the jelling agent has been stirred in, pour the boiling hot fruit jelly into the frame or brownie pan. Allow to set and cool completely, which will take at least 2-3 hours. When the jelly is completely cold, run the blade of a knife all around the edge to detach it from the frame or paper; then cut it into squares about 1 inch. Lift off the frame; then roll the squares one at a time in granulated sugar (preferably large grained). This step is not absolutely necessary; it does, however, keep the jellies from sticking to each other if piled on top of each other when served and makes them more attractive. To Store: The uncut jellies will keep for 2 months wrapped in the non-stick parchment paper it is molded on. Placed in a box, and kept in a cool cellar or the refrigerator. If kept in the refrigerator, the jelly picks up a little moisture but it keeps its shine better. Once cut and rolled in sugar, the jellies will keep for a week in a closed container in the refrigerator; it is preferable to place them in individual paper cases if they are to be stored in this way to keep them from sticking together; these homemade fruit jellies are softer than commercial ones. These were my favorite treat when I was a kid and I truly feel comforted when I see them again. I like that your recipe makes them so accessible. Great entry for both events! You are truly amazing! I haven't seen these in ages and ages. I echo everyone else's sentiments. These are just too delicious and sweet! Oh, I really want to try the pear one. These look really delicious - I am tempted by the apple flavour! I most recently had these at The Fat Duck where Heston Blumenthal served beetroot-flavoured ones. So you are in good company :-) Thanks for participating! ah, I have never come across a recipe for these- great! I love it! my grandmother always had pâtes de fruits when I was younger, and I remember i had one time a few to many and became so sick...but now I think I will take the risk - they look so yummy! =) very nice entry! The colours of autumn. These look so attractive and utimately delicious! They look delicious, Sam! Also, I'm really impressed with your Indian sweets. I'm Indian and there's no way I can cook like that! You can also do them with fresh fruits and gelling for jam. As well as you make jam but with longuer cooking. have you made the pates with wine instead of fruit?